Hastings United Football Club moved up to second in the table following a third consecutive victory this afternoon (Saturday). First half goals from Gary Elphick, Jack Dixon and Davide Rodari gave Chris Agutter’s side a come-from-behind 3-1 win away to 10-man Three Bridges in the Bostik League South East Division. Hastings moved above Horsham and Ashford United, who contested a 0-0 draw with each other. Fifth-placed Haywards Heath Town - the other team in the play-off spots - also drew, 2-2 away to leaders Cray Wanderers. Bradley Stevenson and Jack Tucker, who joined Hastings on loan from League One club Gillingham yesterday, went straight into the starting XI. Sam Beale, Jahmal Howlett-Mundle, Daniel Ajakaiye, Jordy Mongoy and Charlie Horlock formed a very strong substitutes’ bench. Hastings struggled to get their passing game going during the opening 20 minutes as Bridges packed the midfield and were swarming all over the visitors. Bridges took a 17th minute lead with the first real chance of the game. The big and muscular figure of Ibby Akanbi picked up the ball inside his own half and ran through two or three Hastings players before planting his finish into the far corner. For the next five minutes or so Bridges began to push Hastings back, but in doing so they stopped packing the midfield, which gave Hastings more space. Sam Cruttwell started to play some good balls forward and Hastings began to get into the game. Hastings equalised in the 27th minute. A lovely free kick from Cruttwell was headed home by Elphick, who rose above everyone at the far post to score his first Hastings goal. Bridges were reduced to 10 men just six minutes later as Brannon O’Neill was shown a straight red card for a dreadful challenge on Rodari out wide. Rodari, recently back from a major knee injury, was okay, but took several more hefty tackles as the game progressed. 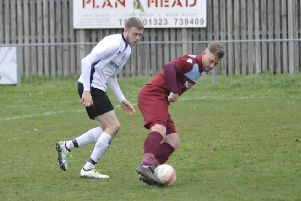 The red card certainly benefited Hastings, who took control for the remainder of the first half. The visitors passed the ball well and created opportunities going forward while not being threatened at the back. Two goals in four minutes put Hastings firmly in charge. The free kick which followed the red card was half cleared by Bridges to the edge of the box, from where Dixon struck a not particularly powerful yet very accurate shot into the bottom corner. Hastings went 3-1 up when Jamie Fielding picked the ball up just inside Bridges’ half and surged past four or five opponents into the box before squaring for Rodari to score his third goal in as many games with a simple finish. Bridges had slightly the better of the second half and caused a few problems down the flanks, albeit without really looking like scoring as Hastings soaked things up well. That said, Bridges had a golden opportunity to pull one back when Howlett-Mundle somewhat clumsily conceded a penalty, but Hastings goalkeeper Louis Rogers guessed correctly and made a good save low down. That proved to be the visitors’ last moment of concern and they might have widened their margin of victory had Ajakaiye not fired over when invitingly placed late on. Against physical opposition and on a pitch which cut up very quickly, Hastings would’ve been pleased to come through a tough game with a good performance and three valuable points. Adam Lovatt was excellent in midfield, as was Fielding, Cruttwell had another decent game and Rodari was a handful throughout. Tucker and Stevenson did well, the latter showing some lovely touches, and the defence looked strong. Hastings: Rogers, Elphick (Howlett-Mundle 55), Cruttwell (Beale 75), Rodari (Ajakaiye 66), Lovatt, Adams, Tucker, Stevenson, Fielding, Azeez, Dixon. Subs not used: Mongoy, Horlock. Attendance: 131. Bostik League South East Division top half (played-points): 1 Cray Wanderers 30-72 (+40 goal difference), 2 HASTINGS UNITED 31-59 (+25), 3 Horsham 31-59 (+22), 3 Ashford United 30-58 (+32), 5 Haywards Heath Town 30-56 (+19), 6 Hythe Town 31-47 (+10), 7 VCD Athletic 30-47 (+1), 8 Whyteleafe 30-42 (+8), 9 Phoenix Sports 30-40 (-3), 10 Ramsgate 31-38 (+2).